Me and my new idol, SE Smith. As a reader, one of my great happy making things is meeting my favorite authors. Last Saturday I got to experience that thrill many times over. It was Coast Magic Con weekend at Daytona Beach. Sadly, I had to miss out on the con this year. By all accounts, organizer Jennifer Morris managed to once again boost the conference up a level in this, its third, year. Despite missing the awesomeness that was the conference, I was able to attend to at least attend the book signing. My mom, who is a super cool reader herself, and I drove three hours each way for a chance to meet the stars. One of the big draws for me was the chance to meet SE Smith. She was my best discovery of 2014 and it was a great reassurance to see her surrounded by the 30-some books she has written. I have plenty more reading to do before I catch up with all of her books. SE was super nice to us and took the time to pose for a picture. 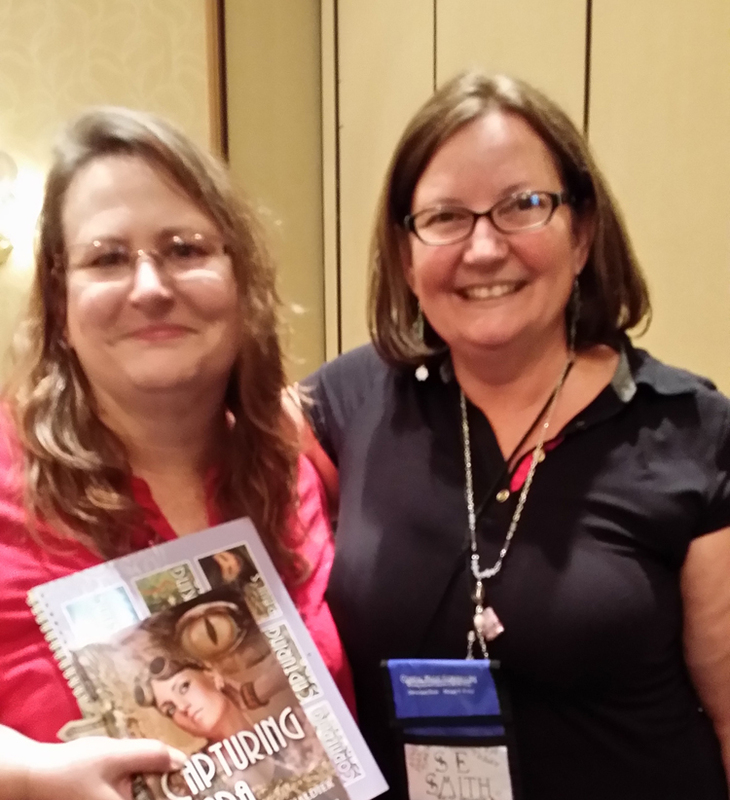 I also got to see friend and favorite gay SFR author, KC Burn. We live on opposite coasts, so this was a great chance to see her. You can’t see all of her t-shirt in the photo I got, but it says I love aliens. And that is why I love KC! 😉 Like minds, definitely. I spoke to many other author friends and meet a few new to me authors I’ am looking forward to trying. Here are a few of the books they were signing. To make the day perfect, I also got to hang out with Trina, one of our former Smart Girls, and our very own Chudney who will be traveling a lot this year as she releases more novellas in her Central Florida Pack series. And, of course, the day would not have been complete without stepping out of the hotel and onto the Daytona Beach Boardwalk. It was a beautiful day, clear and cool. You just can’t beat that ocean breeze. If you have a chance to attend a book signing or reader event, I strongly recommend you jump on it. There is something truly wonderful about communing with other book peeps that makes you feel better about the world. If you do have plans to attend or have been to an event recently, I’d love to hear about it!